The Busters Are In! Tee Design Review. The Busters Are In! 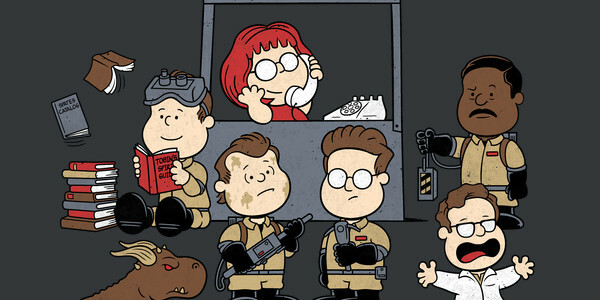 tee design is for the Peanuts and Ghostbusters fans. The concept for The Busters Are In! tee is to mash up The Peanuts with Ghostbusters by parodying Lucy's "The Doctor Is In Stand" for "Paranormal Help". Oddly enough this mashup works well. While the comedy Ghostbusters was not all doom and gloom, this does add even more liveliness to the crew. Especially when looking at the Louis Tully character as he is running away frantically from Zuul. 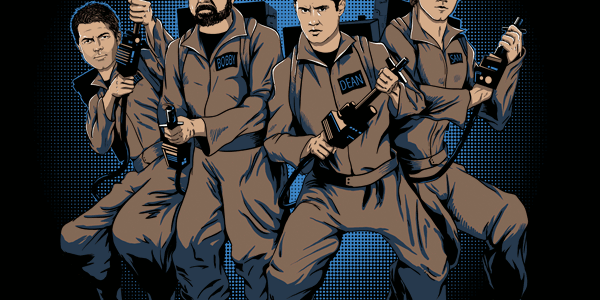 But the best part of this tee is how Peter Venkman is the only one that appears to be slimed. As for the artwork, the Peanuts style is emulated without a hitch. The personalities of the different Ghostbusters characters come through just as they are in the movies. There is excellent use of a few colors that is a prime example of how far a simple palette can be stretched. This The Busters Are In! 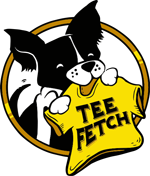 tee is more for anyone. It blends the mellow old school comics with retro movies that never go out of style. The Busters Are In! Tee Design by adho1982. I Ain’t Afraid of No Demons Tee Design Review. The I Ain't Afraid of No Demons tee design is for the Supernatural and Ghostbusters fans. This concept is not that original or creative as it is an obvious connection that many designers like to do since both franchises have characters that hunt down ghosts, monsters and dead things. But this version of the mashup is better executed than the other ones I've seen so far. 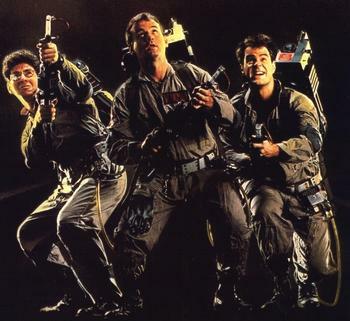 The Supernatural crew replaces the Ghostbusters' cast but keeps Ghostbusters uniforms. The Ghostbusters' weapons replace the Supernatural ones.The Muon Trap has a Devil's trap symbol on it. Sam's and Castiel's legs and stances seem a bit off as something doesn't look right. But other than that this shirt is solid. As for the artwork, it has great colors and is drawn quite well. There isn't much for shading (at least for the faces) which really isn't needed in this case but it wouldn't hurt if done right. This I Ian't Afraid of No Demons tee will make a great gift for Supernatural and Ghostbusters fans. It's a great 50/50 mash up. This design is ideal to wear while watching Supernatural obviously or while attending Comic-Cons. I Ain't Afraid of No Demons Tee Design Nickos Designs. Busted Ghost Tee Design Review. 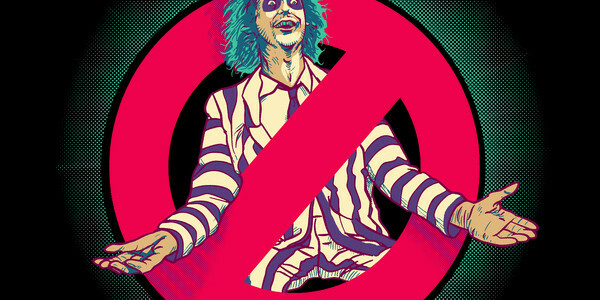 The Busted Ghost tee design is for the Pac-Man and Ghostbusters fans. The concept is far from original as there have been various Ghostbusters and Pac-Man mash ups and parodies. This one uses the ghost trap as a coffin. Speedy aka "Pinky" is the ghost in the coffin but the character is shown as a dark blue. This is because when Pac-Man eats a power pellet the ghost turn blue then they can be chomped. However, once chomped they no longer have their "sheet" or color as they just roam around as floating eyes. This was done this way because eyes only would look weird in a coffin. The best part of this design though and by far the funniest thing about it is how Shadow aka "Blinky" stares at the coffin like he knows something is not quite right. As for the artwork, it is a decent illustration but it isn't perfect. For starters, where is the other lid flap and hinges for the coffin? At first glance people might not notice that it is missing. Some may never notice. Second, the shading is great except the lighting on the ghost in the trap is different. It is just a cartoon type design so it really doesn't matter so much but I notice it. IT was done that way to show the contour of Pinky because that is the only visible side. Illustrators often break the rules of physics to force a perspective. It does however look good, it has great coloring. The layout is perfect. the middle ghost Pokey aka "Clyde" is raised a little in order to have him stand behind the others so they aren't in a perfect straight line. Making it look more natural and overall better than lined up like ducks in a row. Each ghost also has their own facial expression. This Busted Ghost tee will make a good gift for Pac-Man or Ghostbusters fans. Basically anyone that was around in or at least born in the 80's will appreciate it. There are no Kids' tees for this design from this retailer so it gets docked for that. Wear this tee anywhere and everywhere that tshirts are socially acceptable. Busted Ghost Tee Design by Naolito. 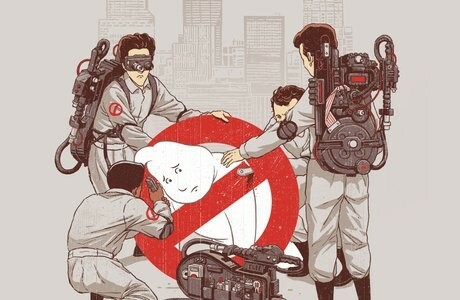 The Ghostrescuers tee design is a funny spoof of the Ghostbusters franchise and logo. Well this Ghostbusters parody had to be made at some point. Each of the original four Ghostbusters are included in this scene. They are either facing away or have their faces covered with gear. The tie in of the Proton Pack being represented as a toolbox is a hilarious touch. But all of those details cannot compare to the priceless expression of shame and embarrassment on the face of the busted ghost that is being rescued. Note how Spengler is wearing his goggles and how Ray is staying is the one comforting the trapped spirit, staying true to their characters. The artwork is clean and it is colored and shaded masterfully. The faded skyline in the horizon is an unnecessary detail but it looks awesome regardless. The mirror image of the prohibited symbol or "No" sign has some vintage distressing for even more aesthetics. This parody is perfect to wear at any casual setting and all fans of the Ghostbusters movies will love to have this tee.